Converts SQL resultsets to HTML / CSS tables. 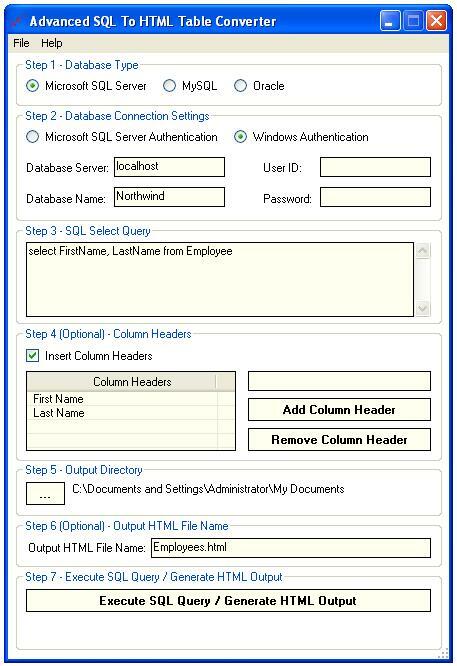 Advanced sql to html table converter is a relational database client utility that allows execution of sql (structured query language) statements on microsoft sql server and mysql databases. Resultsets returned by select queries are automatically persisted as html and css table files to a directory of your choice. Advanced sql to html table converter automatically persists most recently used output directory path and allows assignment of custom names to output html files. 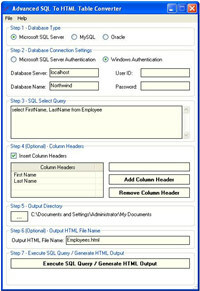 Advanced SQL To HTML Table Converter is an utility that works under windows xp, windows vista, . Estimated download time for Advanced SQL To HTML Table Converter on a common adsl connection is less than a minute. 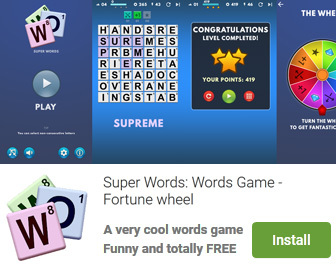 Version 1.7 was released two thousand eight hundred ninety six days ago by Advanced Reliable Software, Inc.. Click the green download button to download it now.